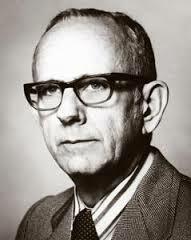 The Hucker Founders Award is named after Professor Charles O. Hucker, who came to the University of Arizona in 1956 and established the Oriental Studies Department, the predecessor of University of Arizona’s current East Asian Studies Department and Near Eastern Studies departments. After teaching at Oakland University, in 1965, Professor Hucker went to the University of Michigan, where he chaired the Department of Far Eastern Languages and Literatures. To honor his outstanding career as teacher and scholar, the regents of the University of Michigan established the Charles O. Hucker Professorship in his department. After retirement, Prof. Hucker and his wife Myrl moved to Tucson, and to honor his memory, Mrs. Hucker generously established the Charles O. Hucker Founders Award for Excellence in Chinese Studies. This award has been given annually since 1997 to honor a student for academic achievement in the field of Chinese. 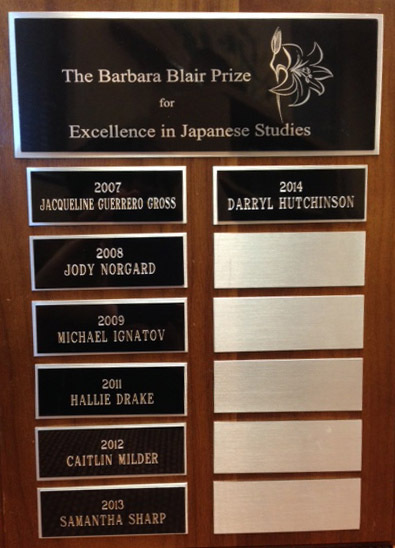 The Blair Prize in Japanese Studies, started in 2007, is named after Barbara Bowman Blair (1925-2005). Mrs. Blair graduated from Fort Hays State University in Kansas, with a B.A., and did post-graduate studies at Indiana University and the University of Arizona. Mrs. Blair first became interested in Japan during a visit in 1969, and since then traveled to Japan twenty-nine times, including many extended stays. She taught English at a number of Japanese companies, and began a lifelong study of Japanese arts, including flower arranging and brush painting. After serving as president of the Indiana Chapter of the Japan America Society from 1974-77, she founded the Tucson chapter in 1981—known as JAST, the Japan-America Society of Tucson. Mrs. Blair worked tirelessly to promote Japan-American understanding, sponsoring visiting Japanese officials and students, teaching about Japanese culture, and acting as consultant for numerous Japanese and American companies. According to her obituary, “Her work was revered in Japan and she was awarded the 4th Degree of the Order of the Precious Crown with Wisteria in 1989. This award [is] the highest that can be given to an American woman.” The Blair Prize was established both to honor Barbara Blair, and the academic accomplishments of U of A students, but also in the hope that the recipients will, in their own individual ways, contribute in the future to cross-cultural understanding, particularly between the nations of Japan and the United States.